In a wild one in New Orleans, the Saints outlasted the Detroit Lions, 52-38, fueled by impressive performances from the Saints backfield, in their first game since trading away Adrian Peterson. 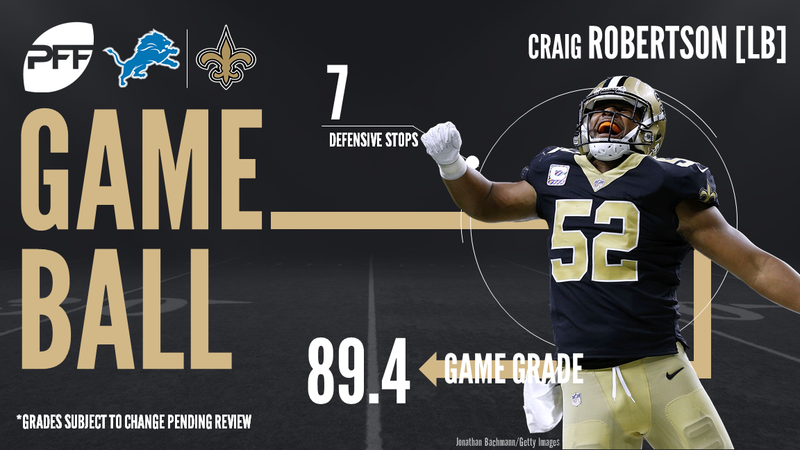 RBs Mark Ingram and Alvin Kamara combined for over 200 yards and two touchdowns while the Saints defense registered three touchdowns of their own in the victory. After building a 31-10 halftime lead, New Orleans opened up an even bigger lead with two quick scores to jump out to a lead of 45-10, however, 28 unanswered points later, the Lions needed their third defensive touchdown of the day, a Cameron Jordan interception in the end zone to push their lead back to a comfortable two-score margin. In all, Jordan, S Kenny Vaccaro and rookie CB Marshon Lattimore scored touchdowns for the New Orleans defense in the contest. In all, the Lions committed five turnovers in the game, three interceptions from QB Matthew Stafford and with that, we give you our PFF exclusive takeaways from the contest for each team. The Saints decided that Adrian Peterson was dispensible largely because of their confidence in rookie Kamara, and his performance on Sunday didn’t dispel those notions. Kamara rushed for 75 yards on just 10 carries, forcing three missed tackles and gaining 43 of those yards after contact. He also caught all four passes he was targeted on for another 12 yards. On a day when star Saints receiver Michael Thomas was quiet, Ginn Jr. picked up the slack a bit. He was targeted just four times, but caught all four passes for 66 yards. More impressively, 53 of those yards came after the catch and forced a missed tackle on his touchdown catch. He averaged an impressive 3.00 yards per route run for the game. It was an all-around complete game for Robertson, as he finished with grades of 77.1 when pass-rushing, 84.6 in run defense, and 83.4 in coverage. Robertson had two pressures when rushing the passer, while adding another six solo stops. He had a pass defense that was nullified by penalty. Of course, he also had the huge strip sack on Stafford that he subsequently recovered. Jordan was unstoppable when rushing the passer in this game, racking up a ridiculous two sacks and seven quarterback hurries. His 87.7 pass-rushing grade was the second-best in the game among either team. Jordan ended with a great pass-rushing productivity score of 14.5 for this game, which increased his season PRP to 11.8, a top-10 mark among edge rushers. Tate was a star for the Lions offense on Sunday, making play after play for his team. Obviously the highlight was his huge touchdown reception, but he caught 7-of-8 passes thrown to him for 96 yards. Tate gained an impressive 75 yards after the catch, and forced four missed tackles. Tate’s 13 missed tackles forced so far this season lead the NFL by a wide margin. It was a tough game for Stafford, although not entirely his fault. Stafford was under pressure on 39 percent of his 59 dropbacks, and that’s where he really struggled. He completed just 8-of-17 passes for 106 yards when under pressure, and was sacked six times. He also had a hard time pushing the ball downfield, completing only 4-of-11 on passes more than 10 yards downfield. But again it wasn’t all his fault as Stafford had seven passes batted down at the line, and another four dropped by his receivers. While Robinson made the splash play when he dropped off his pass-rush to pick off Drew Brees for the walk-in pick six, that wasn’t his only big play. Robinson played well all game, as evidenced by his 85.0 pass-rush grade and 87.3 run defense grade. Robinson made three solo run stops and was destroying blocks and ruining the point of attack all day long. Robinson also added a batted pass on top of his interception. While Spence didn’t record a pressure in this game rushing the passer, he still managed to record a high grade. That was thanks to his impressive run defense all game. Spence finished with three solo run stops, but that doesn’t do him justice. Spence beat his blocker easily almost all game, blowing up plays and forcing the Saints’ running backs to constantly change their intended point of attacks. His run defense grade of 88.1 was the second-highest of the game.